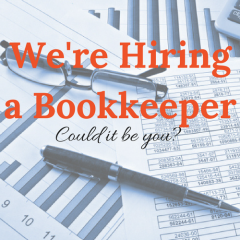 Home » Blog » We’re Hiring a Bookkeeper! Do you love working with numbers? Do you do a little dance when the reconciliation matches? Are your QuickBooks skills so epic you wish you could take it to America’s Got Talent? If so, you may love our team. We are an I.T. provider facilitating computer / network security and support services for both businesses and consumers from our office in Burlington, Washington. We have earned the distinction of business of the year more than once. We pride ourselves on customer service and strive to have a team work dynamic within the culture of our organization.